My very first assignment when I joined the PennSound team was to segment a recent reading by Christian Bök at the Kelly Writers House. It seems only fitting to start my “Notes from PennSound” commentary by returning to audio file that I cut my teeth on as I learned the ins and outs of PennSound's infrastructure, and to an author that has been unavoidable in discussions concerning performance, sound, experimentation, technology, word play, computational composition, 'pataphysics, unintentionality, intentionality, and semi-intentionality. Christian Bök probably needs no introduction, neither for the members of the poetry community, nor for the general population, because chances are that in one way or another, you've been exposed to his poetry before. 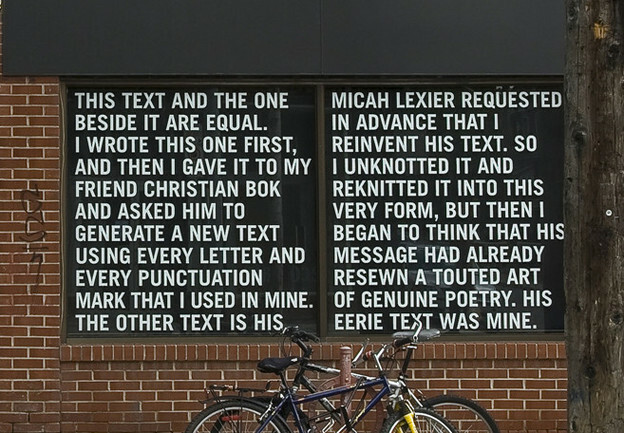 Whether it's from a description of Eunoia's one-vowel-per-chapter composition, or an image of “Two Equal Texts” (pictured above), Bök is possibly the most ubiquitous contemporary poet. A testament to this is the fact that two weeks ago, the social news aggregate Reddit, which normally shies away from the arts, and especially poetry, “discovered” Lexier and Bök's “Two Equal Texts” for the second time this year. The poem amassed 1936 “karma” (the numerical popularity score for the site) in its last posting, and 2323 karma the time before that. Not only is this higher than the top scoring entry on r/Poetry, a subsection of the site exclusively devoted to poetry, which scored a measly 608 karma, but, when these two posts are taken together, “Two Equal Texts” is more popular than any other poetry-related post on the entire site (based on a popularity sort on the top results for “poem,” “poet,” and “poetry”). Considering Reddit's role in web-based cultural dissemination, Christian Bök may just be the most popular poet on the internet. Part of the reason for this internet popularity may be Bök's engagement with the fundamental building blocks of communication. Words, sounds, and noises (and in the case of “The Xenotext Experiment,” even DNA strands--the building blocks of life itself) are broken down into their most basic components, then reordered, refashioned, and repurposed into new pieces and new wholes. His work is startlingly diverse, and each new poem feels fresh and alive. There is something primal about Bök's work, even when both the process and the product are complex. Perhaps this is why his work always feels so engaging. And his November 2009 reading at the Writer's House is no exception to this. This opera is considered one of the most difficult operas to stage in the history of Canadian music...because the entire action has to take place on a remote northern Canadian lake at four o'clock in the morning, and all the actors are in fact inside gigantic war canoes on this lake, with the entire orchestra sequestered in the surrounding forest, and people have to actually fly in, hike, and camp out before the event in order to be able to see it. The ritualization of the performance space has a magnetic draw in the way it breaks down the theater walls. The imagined space of performance sounds so appealing—given the chance I'd immediately travel to the Canandian wilderness to camp and watch the production. It evokes the mystical in a way that many other performances could never achieve. However, the opera's access barrier is so high that the imagined space evoked by this description begins to rival the actual remote space in which the opera is set. In reality, sitting in a campground with 5000 other people, wrecking the environment and trying to stay awake until the 4 AM start time of the performance would be exhausting. But the imagined world remains pristine and undisturbed. Undisturbed, that is, until Bök's performance starts, and the screeches and wails that follow sound all too real and horrifying. Maniacal laughs and deep roars disrupt the imagined space but make it more real--closer and more possible. Of course, there are so many more Christian Bök resources on PennSound, and all of them phenomenal. I strongly encourage anyone who hasn't explored the full gamut of Bök material on the site to do so immediately. I first joined PennSound in January 2010, and in the three and half years since then, I have processed an unbelievable amount of material through the site. Not only do I continue to add to the ever-expanding MP3 collection, but my time with PennSound saw the introduction of new MP4 capabilities to our servers, and an expansion into video collections as well. Some of these audio and video recordings you might remember from the New At PennSound sidebar on the PennSound home page. Collections, series, special events, and individual readings came and went in our sidebar, with the cream of the crop getting longer descriptions in the PennSound Daily. I want to revisit and reflect on some of these items from my time at PennSound, as our overall collection has grown, and poets have more recordings on the site. But, more importantly, I also want to revisit some of those recordings that might have slipped under the radar. Recordings that were impressive or influential to me as I processed them, but that may not have gotten the attention they deserved. These "Notes from PennSound" are not just for the poets that most people listen to when they visit PennSound, but an attempt to unearth some of the smaller and lesser known recordings. PennSound is a treasure trove of material, and it's time to dig in. 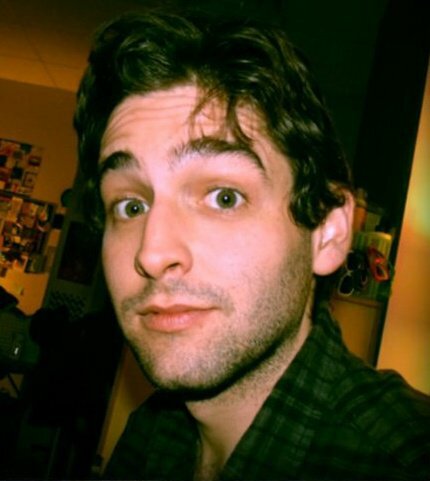 Jeff Boruszak is a graduate student in the English Department at the University of Texas at Austin, studying contemporary poetry and digital poetics. He is an Associate Editor for PennSound, and a 2010 recipient of The Kelly Writers House's Bassini Writing Apprenticeship.